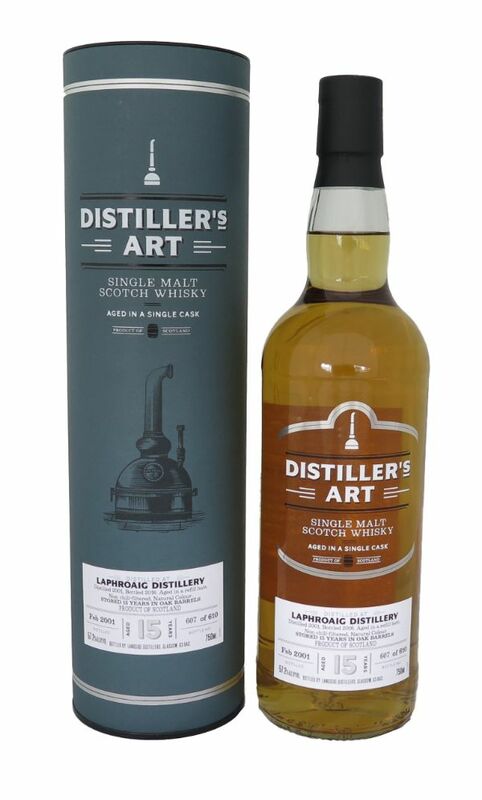 The Distiller’s Art collection is a large range of single-cask bottlings showcasing the character of a region or of a distillery in particular. Bottled at natural cask strength, unadulterated with caramel or chill-filtration, these single malt and single grain selections are chosen from specially selected individual bourbon and sherry casks. The distinctive and straightforward design of the presentation does justice to the quality of the whisky and makes the Distiller’s Art bottle stand out on any shelf. All bottles are individually numbered. The Laphroaig Distillery, on the Isle of Islay, was established in 1815. Nose of peat and bonfire ash with a hint of lemon. Multifaceted palate showing peat smoke, pepper, ash and iodine. Mellow, long finish with lingering peat.